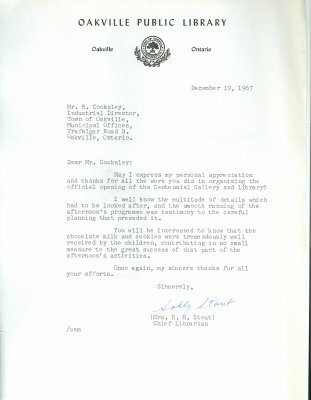 May I express my personal appreciation and thanks for all the work you did in organizing the official opening of the Centennial Gallery and Library? I well know the multitude of details which had to be looked after, and the smooth running of the afternoon's programme was testimony to the careful planning that preceded it. You will, be interested to know that the chocolate milk and cookies were tremendously well received by the children, contributing in no small measure to the great success of that part of the afternoon's activities. Once again, my sincere thanks for all your efforts.